Presenting the first look of the upcoming romantic drama Lekar Hum Deewana Dil which will have fresh leading pair in the form of debutants Arman Jain and Deeksha Seth. Arman is Ranbir Kapoor’s cousin while Deeksha has done some films down south. 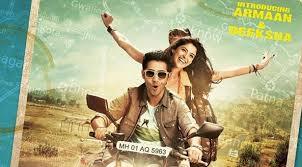 It is their first venture in Bollywood. The movie is directed by Intiaz Ali’s brother Arif Ali and produced by Dinesh Vijan & Saif Ali Khan. It is presented under the banner of Eros International and Illuminati Films. The movie will release on July 4 2014. Stay tuned and be Filmy for more such goodies on Blog To Bollywood.